Three Sisters, a women’s friendship novel by author Susan Mallery, is moving upward in the bestsellers ranks in its third week of release. Three Sisters is at #3 on the New York Times e-book bestsellers list, at #6 on the New York Times combined paperback and e-book bestsellers list, and at #5 on the USA Today bestsellers list. The reading community is incredibly social. When we finish a book we love, the first thing we want to do is to tell someone about it. 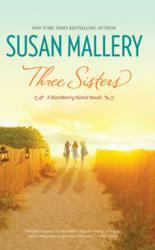 Prolific author Susan Mallery has hit new highs on several bestsellers lists with her latest release, Three Sisters, a novel about the friendship that forms between three women, neighbors on Blackberry Island, who are each at an emotional crossroads. The book debuted three weeks ago at #20 on the New York Times bestsellers list for combined sales in paperback and ebook and #19 on the USA Today bestsellers list. This week, Three Sisters is at #6 and #5 on those lists, respectively, and #3 on the New York Times ebook bestsellers list. The USA Today list tracks sales of all books on a single list – fiction, nonfiction, hardcover, paperback, ebook – and the #5 ranking is a new high for Mallery, whose previous best was #8 with last summer’s All Summer Long. With over 300 reviews on Amazon and an average of five stars, Three Sisters does seem to resonate with its primarily female audience. Mallery hopes it will be a popular selection for book clubs looking for a thought-provoking and ultimately uplifting story of women’s friendship. A readers’ guide has been included in Three Sisters to facilitate book club discussions. For ebook readers, Mallery has provided a printable version of this discussion guide on the Blackberry Island website. Susan Mallery is a familiar name on the bestsellers lists. Her 2012 releases spent a combined total of 41 weeks on the USA Today list last year, and three of her romance novels debuted in the Top 10 on the New York Times mass market paperback list. Three Sisters is the first of five novels Mallery will release in 2013.